FLIR ResearchIR on FLIR:n R&D ohjelmisto tieteellisen tutkimuksen ammattilaisille ja niille jotka käyttävät jäähdytettyjä lämpökameroita. (MAXin avulla pystyy toki käyttämään jäähdyttämättömiäkin kameroita)Voitte tutustua kumpaankin ResearchIR ohjelmistoon lataamalla ohjelman 30 päivän kokeiluversion, tämän ajan jälkeen ohjelma vaatii joko lisenssikoodia tai USB-lisenssidonglea jonka voit halutessasi tilata Infradexiltä. My Matlab® filter doesn't seem to work. How can I solve this? RIR4 Max and MATLAB® communicate via a feature called the Matlab Filter. This is possible because MATLAB® is registered on your system as an Automation Server. This sets up MATLAB® engine so that external applications like RIR4 Max know which version of MATLAB® to talk to.This registration may disappear, for many reasons. When this happens, MATLAB® is still present in the list of RIR4 Max filters; it is still possible to select an .m file. 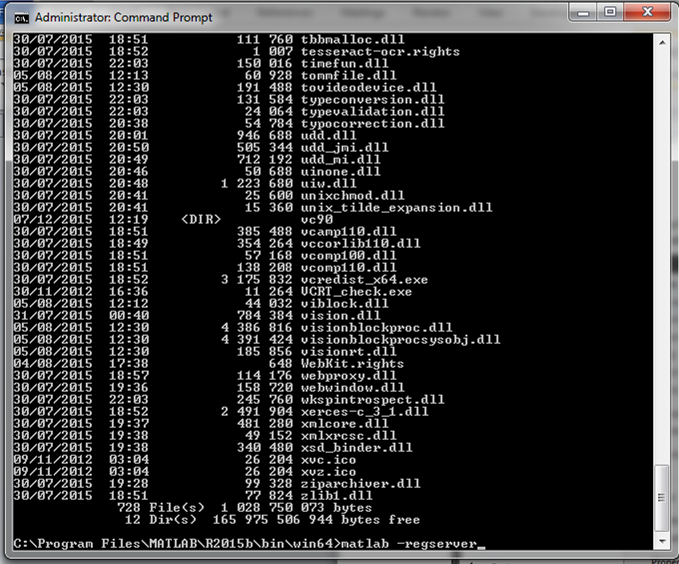 It apparently tries to loads but its execution fails.The solution is to manually re-register the server. To register MATLAB® as an Automation server from the Windows system prompt, first open a Windows Command Processor using the Run as administrator option, if necessary. 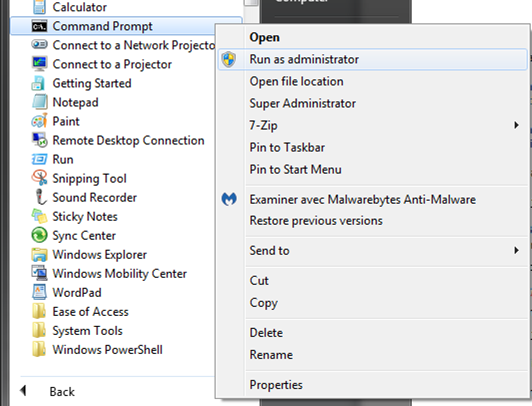 Move to the folder containing the executable file for the MATLAB® version you want. 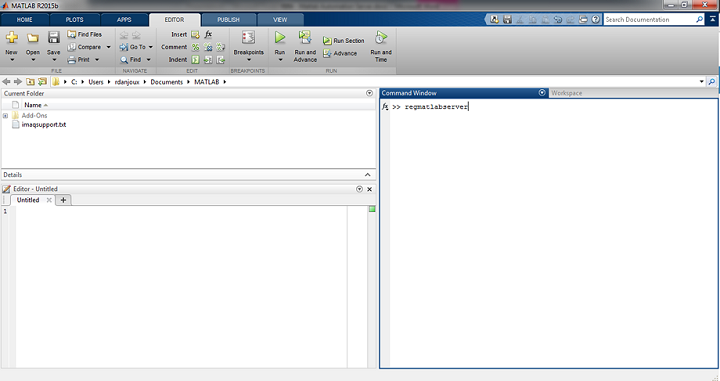 Then type matlab -regserver, and press Enter. MATLAB displays a minimized command window. Open this window and exit MATLAB®. How do I open multiple .img or radiometric JPEG files in ResearchIR 4? Put all the .img or radiometric JPEG files in a folder and drag the folder onto the ResearchIR 4 icon or into the main window if ResearchIR 4 is already open. You will now obtain a pseudo-sequence in ResearchIR 4 composed of all the files in the folder. Please note that the folder must not contain any other files. In case a temporal plot is drawn from the pseudo-sequence, set the x-axis to display the frame number instead of time. Can I upgrade my FLIR ResearchIR 3.x license to FLIR ResearchIR Max 4.x? Existing customers holding a valid license for FLIR ResearchIR Standard 3.x or FLIR ResearchIR Max 3.x are eligible for a free FLIR ResearchIR Max 4.x license. To receive your free FLIR ResearchIR Max 4.x license, go to the link below, enter your existing license key, and click Get New license. Is it possible to stop recording by my FLIR A655sc in ResearchIR when a digital input is activated? Unfortunately, no. It is only possible to start a recording based on digital input activity. 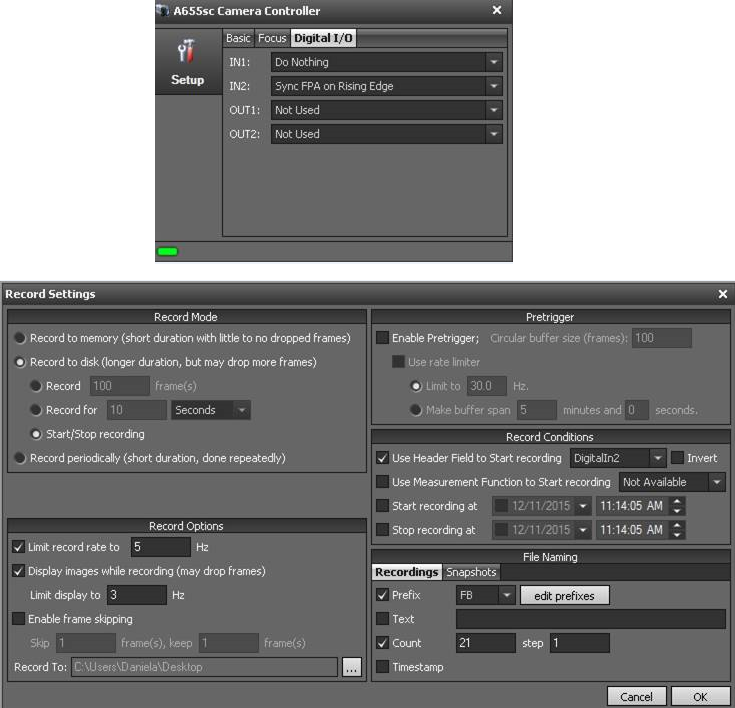 To start a recording, configure ResearchIR according to the images below. How to Activate / Deactivate my ResearchIR 4.x License? Introduction to ResearchIR 4.x license handling. For both cases, the customer can complete the entire process without the need to submit a ticket to Custhelp. The RUS tool is attached below to this answer. 1. If a customer PC with RIR4 does not have internet access, but they have another PC that does, the RUS tool can be used to create a file that can be used to generate a activated license file through the web customer portal. 3. On the “Collect Status Information” tab, click the “Collect Information” button. You will be prompted to save a “C2V” file. 4. Go to the ResearchIR customer portal at http://researchir.flir.com:8080/ems/customerLogin.html You should see the following screen in your browser. Enter your product key and click Login. 5. If the key has not been used before, you will see a screen asking to register. Enter your registration information and click Save. 6. One the next screen, click the “Offline Activation” button in the upper right corner. 7. A “Generate License” dialog box will appear. In the middle is a link to download the RUS tool if you have not already downloaded it. At the bottom is a field called “Upload C2V”. Click the “…” button to browse and select the file you created with the RUS tool. Then click “Generate”. 9. In the RUS tool, go to the “Apply License File” tab. Next to the “Update File”, click the “…” to browse for the V2C file you just downloaded, then click “Apply Update”. 10. RIR4 should now see the license when launched. 1. There is no way to “deactivate” a RIR4 license from the FLIR side. This is because there is no communication required between the PC and the server after activation has occurred. However, a customer can transfer a license from one PC to another. 2. You will need to install and run the RUS tool on both the source and recipient PCs. 3. On the recipient PC, launch the RUS tool and click on the “Transfer License” tab. 4. Follow the steps presented in the dialog box. 5. Next to “Save recipient information to”, click the “…” button to assign a name to the .ID file. 6. Take the created file to the “source” PC. Run the RUS tool and go to the “Transfer License” tab. In the “Generate license transfer file” section, click the “…” next to “Read the recipient information file” to browse for the .ID file created in step 5. 7. Click the “…” next to the “Generate the license transfer file to” to assign a name for the H2H file. 8. Click the “Generate License Transfer File” button at the bottom of the window. 9. Take the generated H2H file to the recipient PC. In the “Apply License” tab of the RUS tool, click the “…” button next to the “Update File” field and browse for the H2H file creates in step 8. Click the “Apply Update” button. The license file should be updated and RIR 4 should see the license when launched.